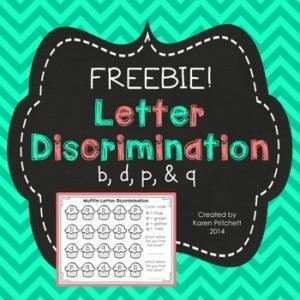 Free supplemental pages to help with frequently reversed letters with a little math vocabulary and graphing tucked in as well. Easy to prepare – just print and go. No cutting, laminating, or color ink! This free set includes 2 supplemental pages plus a graphing page. It can be used alone or with my big letter discrimination set in my shop. You can use these as a center or as a coloring worksheet for commonly reversed letters. I like to put mine in a page protector to use with bingo chips to save on copies. I tucked in a little math vocabulary & counting into this literacy product. Each page has a place to write which letter they find the most and the least. I also included an optional graphing page for your students to color based on how many letters they find on each page. I encourage my students to methodically search for one letter at a time by going left to right, just like reading a book. If you like these sample pages, please check out the big set in my store. It contains over 20 themed sheets for each month of the school year (Aug-June) and sheets for each season along with some cut & paste sorting pages. Just print the pages, and you have a center that lasts all year! Click here to see it!